Edited by Armin Kircher. 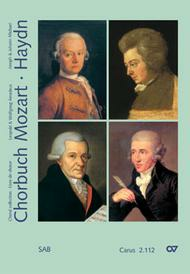 Choral collections for Coro SAM, Mozart - Haydn. Mozart/Haydn 2. Chorbuch Geistl. Sab Einzelex. Sacred vocal music, Hymn settings, Epiphany, New year, Easter and Eastertide, Whitsun, Christmas, Eucharist, Communion, Wedding, Praise and thanks, Feasts of the Blessed Virgin Mary, Hymns in praise of the Virgin Mary, Mourning, death. Choir Book. 136 pages. Carus Verlag #CV 02.112/00. Published by Carus Verlag (CA.211200). The choral collection Mozart * Haydn contains sacred music of two famous pairs of composers from the Viennese classical school: father and son Leopold and Wolfgang Amadeus Mozart, and the brothers Joseph and Johann Michael Haydn. Works selected for this collection include Latin and German settings, canons, motets and movements from the Ordinary of the Mass for a cappella choir or with keyboard accompaniment. The choice of works has been made not only with a view to the broadest possible practical use, but also to providing a selection ranging in difficulty from easy to moderately difficult. This compilation of both famous and little-known works offers a broad insight into the repertoire of church music from the Viennese classical school.